Roger Packard 1994 36 72/72 7012/6605 60 minutes from downtown. 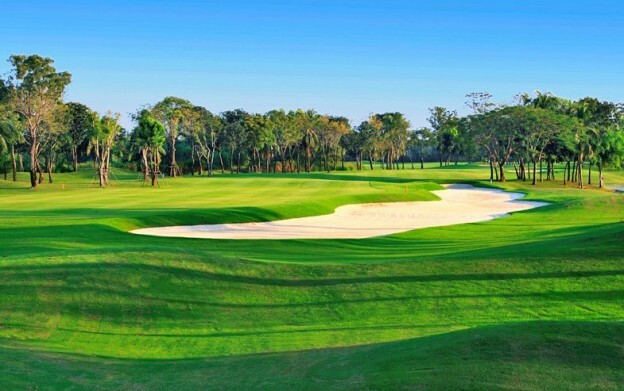 Designed by Roger Packard in 1994 Lam Luk Ka Country Club is one of the finest golf courses within the Bangkok area. This magnificent 36-hole golf course has been well planed with wide fairways and large greens. Roger Packard has obviously put a lot of time and effort into creating a pleasantly shaded atmosphere by the planting of an abundance of mature trees and shrubs. Golfers wishing to play well at LamLukKa will have to think carefully about their shots as the course is based on a premium of accuracy rather than power of play. Well positioned water hazards on either side of the fairways at selected holes make Lam Luk Ka a true challenge for golfers of all levels. Lam Luk Ka is always well maintained and the greens will always be found in excellent condition, the ideal venue for a corporate golf tournament. The magnificent clubhouse has excellent facilities with an exceptional restaurant serving Thai and International cuisine.